Drain Pump – It is also possible that a foreign object is lodged in the drain pump. If the washer is full of water but not spinning, listen for a humming sound that could indicate an issue with the drain pump. Belts – The belts in your washing machine can wear down, and potentially break. If you find a broken belt, make sure the pulley has not seized, which may actually be the root of the problem. Make sure you replace the belt and fix the pulley to prevent the same problem from happening the next time you run the washer. Motor – The washing machine’s motor uses a clutch to control the agitator or spin the basket, check to make sure that the motor is in good working condition. 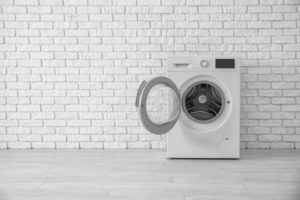 Commercial Laundries has a number of high-quality laundry machines for sale in Florida. When you work with us to get your commercial laundry equipment, we provide you with skilled maintenance, so you never have to worry about a situation like this. Contact us today at 1-800-876-1477.